Take your treatment of sleep disorders to the next level. Review the basics of dental sleep medicine and the TMJ complex. Work your way through a comprehensive exam, oral appliance selection and various bite techniques used commonly in the dental sleep field. Gain an understanding of common problems faced during treatment and the proper guidelines to keep dentists “in their lane” when going into the medical realm. Review and understand the basics of dental sleep medicine, including the science of dental sleep medicine and understanding sleep studies/what to look for. Understand the flow of a comprehensive dental sleep exam and practice this in small groups with the guidance of the supervising doctors. Understand and be able to take multiple bite techniques. This will also be practiced in small groups with guidance. Understand pitfalls and problems with oral appliance therapy that you will encounter. Learn techniques to handle these issues. Understand the different designs of oral appliances and when to use each. 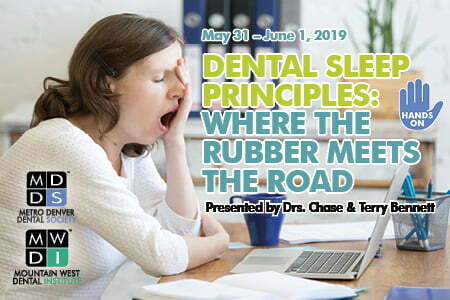 Understand the guidelines of dental sleep medicine to keep your patients and your practice within the scope of dental sleep medicine. Dr. Chase Bennett graduated from the University of Oklahoma School of Dentistry with special distinction. Under the direction of its distinguished program founder, Dr. Noshir Mehta, Dr. Bennett completed an externship at the renowned Craniofacial Pain Center at Tufts University School of Dentistry. He is the youngest dentist to have achieved Diplomate status in the fields of Craniofacial Pain and Sleep Disordered Breathing. Currently, Dr. Bennett lectures nationally and is involved in various research projects on the topics of Craniofacial Pain and Sleep Disorders. He serves as Director of the Apnea & Breathing Clinic in San Diego, CA. Dr. Bennett maintains a private practice in Arvada, CO.
Dr. Terry Bennett graduated from Oklahoma State University in 1972 with a B.S. in Zoology. He then attended the University of Louisville School of Dentistry and graduated in 1977. Dr. Bennett started his private practice in Tulsa, OK that same year. He soon developed an interest in treating patients with chronic head, neck and facial pain disorders. Since 1990, his practice has been exclusively devoted to the treatment of Temporomandibular-related disorders, snoring, sleep apnea, and bruxism.